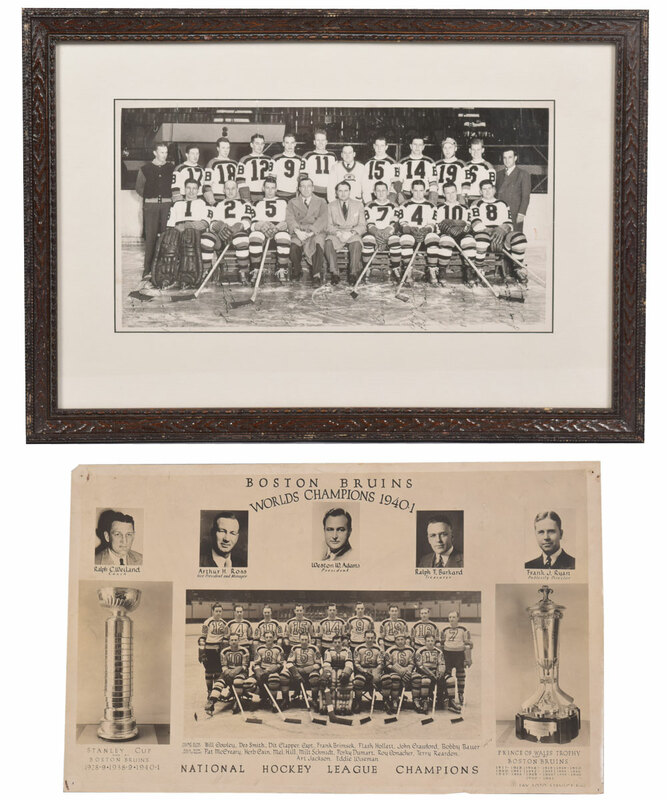 Eddie Shore and Frank Brimsek are among the 18 vintage autographs on the fantastic framed team photo of the 1938-39 Stanley Cup champion Boston Bruins featured here. Including coach Art Ross, this stellar edition of the Bruins counted 12 members of the HOF in its ranks! The Shore, Cooney Weiland, Bobby Bauer and Dit Clapper signatures are among the stronger signatures with Brimsek, Milt Schmidt and Bill Cowley among the fainter and less legible examples. Also included is a vintage 1940-41 Bruins Stanley Cup champions team photo that features a team picture of the likes of Brimsek, Clapper, Cowley and Schmidt between images of the Stanley Cup and the Prince of Wales Trophy. The autographs on the Stanley Cup champion 1938-39 Bruins team photo are arrayed vertically along the bottom of the vintage 7 1/4" x 14” print, which has vertical creases that do not diminish its display as mounted in a matte in a 13 3/4" x 19 3/4" frame. The Stanley Cup champion 1940-41 Bruins team photo measures 10” x 16” with photos of five Bruins executives and staff, including coach Cooney Weiland, GM Art Ross and team president Weston Adams across the top. It is nicely preserved overall with pinholes in the corners, a tiny tear on the top left corner margin, and a few dings to the edges that would not diminish its display in a worthy frame.